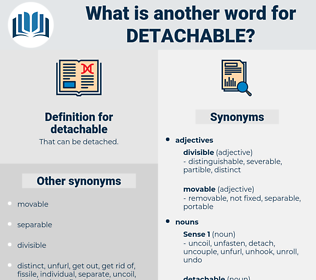 What is another word for detachable? immovable, permanent, unmovable, untransportable, fixed. If we except the speeches, each of which by the necessity of the case is more or less a definite and detachable unit, the periods flow into one another. When he smiled apoplectically above his first waistcoat and detachable collar, his Adam's apple and his mother's heart fluttered. 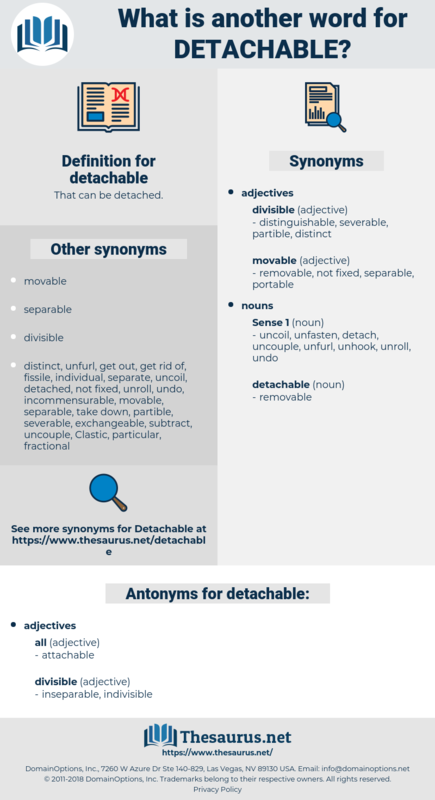 deducible, dishful, display, disavowal, dog flea, dispel, decayable, duckbill, decisively, disciple, disavowable, deshabille, discocephali, dishevel, despoil, decouple, dissociable, disk file, dog hobble, Dutch people, dishabille, disable, decibel.